Six weeks later Hurricane Katrina hit. It scraped the Gulf Coast clean. The levees failed in New Orleans, inundating the Lower 9th Ward and creating a modern day diaspora out of the city that has only partially been reversed. That was ten years ago this August. Overnight, without changing a word, “It’s Gonna Rain” became a song – not about losing somebody – but about losing a city. Playing with Branford Marsalis and Joey Calderazzo in a benefit performance for the North Carolina Symphony in Raleigh three years ago, “It’s Gonna Rain” brought the house down. For Marsalis, born near Bayou Teche, a native of Breaux Bridge, raised in the music of New Orleans, the song was a natural fit. “Playing that particular song with Branford and Joey was a dream come true for me. I’d spent years working and making lifelong friends in Breaux Bridge and Lafayette, LA,” Ainslie says. “I was channeling that when I wrote the song: the Spanish Moss hanging in the Live Oaks, the cotton wood trees, the smell of the rain on the streets. It’s all there. And Ainslie’s latest CD, The Last Shot Got Him (Fall-2014), is entirely recorded on a little arch top 1934 Gibson from Louisiana. “The guitar came to me from Linda Handelsman, a fine composer, arranger and musician who lived in Lafayette at the time. I played three chords on it and it sounded more like Robert Johnson’s recordings than any other instrument I had ever touched. It was made when Johnson was 23. I’m gonna get up in the mornin’ – I believe I’ll dust my broom. I kept my dreams between the cotton rows. Those fields my books, where I wrote with my hoe. Got to be ready when that bride groom comes. and a moon shining in the sky. Know that I’m in heaven when you smile. Wearing one of your pretty things. I’ll take it, if my stuff’ll fit. Or maybe, I’ll just get rid of it. 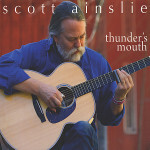 On Thunder’s Mouth, Ainslie – a singer and acoustic guitarist who’s an expert on Robert Johnson’s guitar techniques – applies his winning musical personality to self-penned tunes and non-originals borrowed from Johnson, Son House, J.B. Lenoir, Tom Waits and the John Lomax field recordings treasure chest. The emotional pull of Ainslie’s music is always strong, perhaps most so on the slave lament, “Thunder’s Mouth,” and on the slow, serious folk blues “Another Man Done Gone.” In unobtrusive but unmistakable support of this Vermonter are cellist Eugene Friesen, Cajun guitarist Sam Broussard and multi-instrumentalist T-Bone Wolk.